A special children's book on First Communion is the perfect gift for any boy or girl receiving this holy sacrament. In the Roman Catholic Church, First Communion is a sacred ceremony honoring an individual receiving the sacrament of the Eucharist for the first time. This sacrament is the central focus of the church and is only practiced by Western Catholic Churches. Several Protestant denominations such as Lutherans also laud this day, although the ceremony is not as elaborate as it is with the Catholics. For most part, if a child is born into the Catholic faith, he or she will have their First Communion at the age of seven or eight, although adults converting to Catholicism can receive this sacrament. The person bestowing these gifts can also personalize these books for the child by including his or her name, the date and church in which the sacrament was received, as well as a picture of him or her in their First Communion clothes. A Child's Guide to First Holy Communion by Elizabeth Ficocelli: Informative and easy-to-read picture book about a boy named Justin who is on his way to church to receive his First Communion. Today I Made My First Communion by Dianne Ahern: Story about curious second-graders as they solve the mystery of the Eucharist and prepare to make their First Holy Communion. 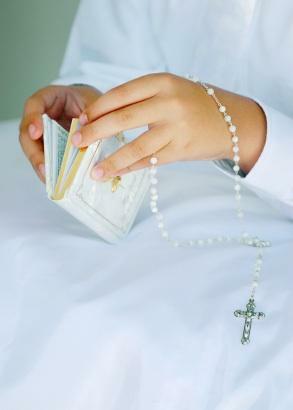 Catholic Free Shipping sells First Communion books, prayer books, rosaries and scapulars. Catholic Store has picture and coloring books, as well as first Mass missals for young children to learn more about the sacrament of the Eucharist. A child's First Holy Communion is quite a milestone in a young Catholic's life and is a day that should be marked with celebration. A special book on First Communion is not only an appropriate gift to give, but also one the child can keep forever.